Have You Eaten a Good Book Lately? Now is the time to grab a spatula and let out a primal scream for Read It and Eat It, our fourth annual edible book festival, is nigh! Our promotion of literacy and gluttony and whimsy will occur in the Glass Pavilion on Friday, March 31st from noon – 1:30. Did I mention eating cake? Because you get to eat cake! 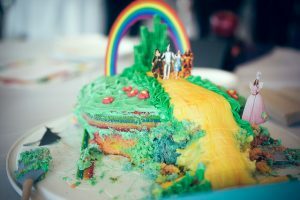 Last year’s festival featured journeys to mystical places, tons of fun with fondant, a magical sorting hat, and a simply stunning rendition of The Life of Pi. Who knows what culinary mischief lies in the hearts of this year’s baking champions? As is tradition, prizes will be awarded by popular vote in the following categories: most delicious dessert, funniest dessert, best effort, best literary theme, and overall best in show. Golly gumdrops, do we have prizes! Fancy a dinner at The Food Market or a lovely brunch at Carma’s? Care to eat oodles of ice cream from The Charmery? Then you have to bake to win! Ready to register? Then do so quickly. The deadline to enter a cake is 10am on Wednesday, March 29. Need some inspiration? Follow our sugary crumbs to tumblr or flickr to gain inspiration from cakes of years past! A Festival of Edible Books? Preposterous! Are You Ready to Read It and Eat It? Baltimore Book Festival (AKA When Bibliophiles Go Wild at the Peabody Library)!